Having a solid WiFi connection in all areas of your house can be difficult without the proper equipment. You can transfer your router to a central location, but even this can be ineffective – which is why you may need an extender. WiFi extenders will improve the coverage of your connection and can improve overall connection speeds as well. NOTE: With some providers, wireless extenders can help with WiFi Blast as well. Additionally, having a faster connection from your ISP (Internet Service Provider) can improve download speeds also. We have looked through many WiFi extenders and boosters to compile this list. We purposefully did not include some of the high-end and very expensive models. We focused on consumer versions for home and small office use. Look through our top 10 best WiFi extenders of 2019 here. The NETGEAR AC1200 EX6150 is a device that will extend WiFi signal in homes that have spots where wireless Internet reception is poor or unable to reach. It supports both the 802.11ac protocol that functions in both the 5 Ghz and the 2.4 GHz ranges. This means it will work with any wireless setup in your home, regardless of how new or old it is. All you have to do is plug it in and wait for the green light to turn on. When you see the green light, it means the router is within range. A red light means it is not within range. The setup process is easy. Simply press the WPS button on your router. If there’s no WPS button, then use the NETGEAR setup app or log into it manually via a browser. If you want to use the EX6150 as WiFi access point, feel free – you can. Just plug the Ethernet cable into it and then you can connect to it with WiFi. It has speeds of up to 1200 Mbps. Also, distance, walls, and other signals play a role in how setup will go, which means each setup is different when it comes to transfer speeds. 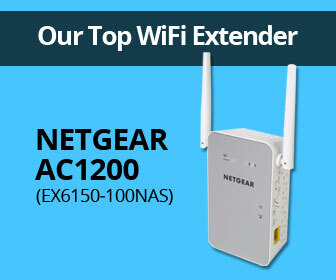 As one of the top-rated WiFi range extenders, the EX3700 does not disappoint. It provides simultaneous dual band, and works to reduce interference with FastLane™ technology. This means both WiFi bands can be used at the same time to establish extremely fast connection speeds. Like most WiFi range extenders, the primary purpose is to provide consistent coverage and connection speeds in a specific area. Whether that’s a home or small office, the goal is to be able to continue working or enjoying an Internet connection without buffering or interruptions. 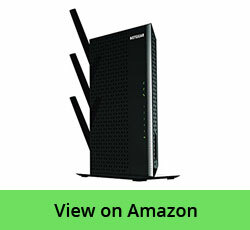 The NETGEAR AC750 EX3700 will be a great option for most consumers. It is a great unit for an apartment, townhouse, or small home. It supports multiple wireless bands and devices, even supporting 802.11ac & b/g/n wireless. With speeds upwards of 750Mbps, it is likely fast enough to allow for general Internet usage, surfing on phones and tables, and other minor media consumption. While this device delivers on most aspects, it falls short in a few areas. With just 1 Ethernet port, it leaves a bit to be desired for connecting other devices with a hardwired connection. Additionally, it may not provide the best coverage for a larger home. Overall, it is one of our top 10 WiFi repeaters because it is effective at its price point, and will be more than enough for many consumers. This device provides maximum performance in its budget class. If you have limited connectivity at home, then this wireless extender can help boost the range of your Internet connection. The TP-Link AC750 Dual Band WiFi Range Extender expands your WiFi range for up to 10,000 square feet so you can use the Internet from every corner of your home. See more about how it works and how it can help improve the overall connectivity throughout your home. 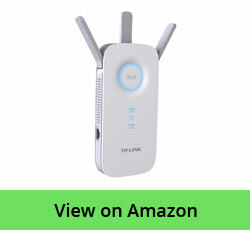 Overall, the product works as how it is supposed to work by extending the range of your WiFi connection. The price is affordable and the setup is easy. The speed won’t be an issue for normal Internet use and you’ll be able to stream videos or movies on most occasions. But, for online gaming, speed is a top priority to avoid lag. It would be best to get a top-of-the-line repeater if your main purpose is online gaming. 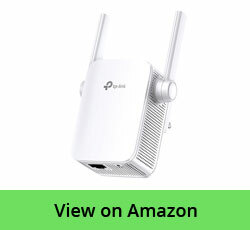 Other than that, the TP-Link AC750 Dual Band WiFi Range Extender will get the job done. It can be hard to obtain access to a powerful WiFI signal in your office or home, especially if you have a low-end router or a big house with areas that are hard to reach where you want to have a fast connection. Video streamers and gamers are often faced with problems regarding long buffering times, dropped connections, unreliable signals, or poor speeds that can make it impossible to truly enjoy the content and/or gaming experience. It might be a big enough headache in many situation that the technology needed to maximize your WiFi signal might have developed to a point where it is both affordable and effective for almost everyone. One key feature that this WiFi range extender offers is being able to increase the range of the WiFi throughout your entire house, despite electronics, walls, and the sheer amount of space that can result in dead spots being created. It is very impressive that you can just plug it into the wall outlet within the dead zone and your router, and it will provide you with a big boost in range, and over total coverage of 10,000 square feet. Even in relatively large businesses or the largest homes, this devices provides excellent coverage. In addition, it features a set of antennas with high performance that are coordinated to offer the maximum range through broadcasting your signal in various directions. When combined with the speed features and powerful amplifiers of the NETGEAR Nighthawk X4, they can really make it into an all-in-one WiFi range extender that provides the ultimate range and speed. This device has also done very well in the past with the feature called beamforming. This is where a more concentrated straight signal line is created between the devices, instead of dispersing the signal in every direction (which weakens the signal). Although both your mobile device and range extender need to be compatible with the feature, a majority of mobile devices that are sold these days use the same type of beamformng technology that is provided by NETGEAR, which means you are at advantage compared to some of the other range extenders that are similar. When you take advantage of both the 5Ghz and 2.4Ghz bands transmitted by your wireless routers, an extremely fast network speed capability is created by the NETGEAR Nighthawk X4. Speeds have been shown to reach as high as 2.2Gbps. This is fast enough for downloading full AAA video games in under one minute. In addition, NETGEAR has made it so that it is compatible with all wireless routers, rather than only ones provided by them or those with similar technology. Therefore, you can take full advantage of its increased speed and range, without having any additional expenses. They have also provided Multiple User MIMO, which is an advanced feature that receives and transmits data to and from more than one device at the same time, instead of attempting to balance out each of the connections while multitasking is being performed. This feature alone provides a solid value that will definitely increase the wireless speeds on multiple devices inside your home without experiencing any unnecessary load times, buffering, or breaking of your signal. There are very few durability concerns with a WiFi range extender. However, whenever you are dealing with the high amount of power that can be delivered by the NETGEAR Nighthawk X4, it is good to know it will continue operating as intended with continuous use. It is also very easy to operate. While speed is incredible important for these devices, understandably, another important aspect is to make sure the device is also designed and built to generate very little noise. This extender has an overall look that is visually appealing but compact, with a basic on and off power control button in addition to a secure connection (WPS) button located on the side. These are common features and nothing drastically different from other similar devices. It isn’t necessary to unplug and put it away during downtimes or when you leave, although if you want to you can. You can also switch between the extended range mode complimenting your access point mode and existing wireless router to create a WiFi hotspot with a simple flip of a switch. A large Ethernet port is also located on the bottom part of the Nighthawk X4 (EX7300). It can be used to plug into wired devices such as video game consoles for easy access. As the quick start guide describes, this range extender is plug and play. All you need to do is plug it in and press the power button. Even when using a picky wireless printer, connecting it is as simple as pressing the WPS button. Setup doesn’t require any drivers, downloads, or installations, making is a very easy device to use, and not any more difficult than many similar WiFi range extenders within the same class. 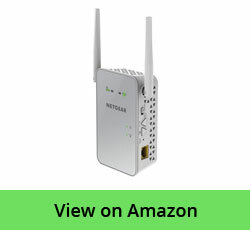 NETGEAR has been a leader of wireless internet connection technology for a long time, and continues to improve ease of use, compatibility, and performance that has come to be expected by WiFi users. The Nighthawk X4 AC2200 (EX7300) WiFi Range Extender has a variety of benefits and it has been designed so that you can be confident that you will maintain reliable WiFi signal in any part of your home or business. It has also been elegantly designed to be easy to use and sleep, without needing any technical expertise or software installation, yet being compatible with all of your various mobile devices. It also won’t look like an eyesore inside your home or business since you can plug it into any available outlet. In terms of its overall structural quality and durability, the high-powered hardware it utilizes, and the ease of setup and use, many recommend this device for those who need serious signal boosting in their large home or business. 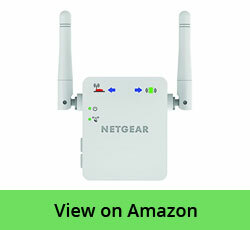 NETGEAR is a great choice when it comes to WiFi range extenders and wireless routers. This company specializes in the design of various effective equipment for providing you with the best possible wireless internet. 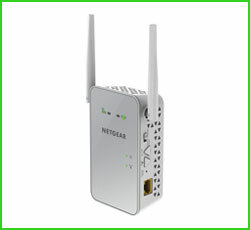 The NETGEAR WN3000RP is a very popular WiFi booster. It is easy to set up, affordable and reliable. There are definitely better boosters out there, but it is a good option if you have any dead spots in your apartment or small house. If you live in an apartment or small house and you are having wireless problems, then it might an issue with your router. Your best choice may be to replace your router with an upgraded or newer model, since one router with higher output is much better compared to an old router that a WiFi extender may supplement. However, the problem isn’t always with your current router, and a new one might be more expensive than an extender. For those sitautions, the best way to get those blind spots covered is to use a simple WiFi repeater. The WN3000RP is a type of N300 WiFi booster. This means it is rated for a 300Mbps throughput. For wireless range extenders, this definitely isn’t the fastest speed, but that is likely the fastest you will get with a booster in this price range. It features an effective and simple desig. It plugs directly into an outlet and comes with adjustable antennas to provide you with the best possible coverage. It has a very straightforward setup process. You just plug it in, press the WPS button that is on your router, and then the button that corresponds on the WN3000RP, and you are all set to go. No special software is required, although the NETGEAR app can be used for troubleshooting any problems you might be having. One drawback to the WN3000RP is there is only one Ethernet port for connecting wired devicee such as gaming consoles and printers. You are severely limited with just one, particularly if there are several devices that you would like to connect. If this is true, then you will need to spend more money on a WiFi booster that comes with multiple Ethernet ports, as it is extremely difficult (or impossible) to find one in this price range that comes with more than a single port. The NETGEAR WN3000RP is pretty basic. This can be a good thing if all you want to avoid dead WiFi zones in an apartment or small home. Although it is not really fast and doesn’t have the same range that more expensive, better range extenders provide, its ease of use and affordability make it a great option for basic situations. The NETGEAR EX7000 Nighthawk, like other high-end WiFi extenders, is large. This device is shaped similar to a router, and comes with multiple external aerials and a separate power supply – putting it in an entirely different league than the all-in-one plug units like the ZyXEL WRE2205. You will need to have an area of 252 x 174 x 31 mm to accomodate the device – although there is an optional stand that comes with it so that you can mount it vertically and minimize its footprint. The NETGEAR EX7000 is mainly built out of plastic. At only 635g, it is light for its size. It doesn’t feature the toughest design in the world, but it isn’t the kind of device that should require an extremely tough case. It has a nice appearance, featuring a glossy gray and black finish throughout. However, realistically the EX7000 isn’t something you would want to make a centerpiece out of. This extender’s headline feature is its ability of reaching AC1900 transfer speeds of 1,300Mbps at 5GHz and 600Mbps at 2.4GHz and keep both of the connections going at the same time. In order to achieve these speeds, you will need to combine it along with the NETGEAR Nighthawk AC1900 router – so make sure to first upgrade it. The extender then hosts 5 Ethernet ports, which means you will be able to hook up an entire extra room, floor, or building with a very fast connection, without needing to worry about every computer being hooked up to WiFi. In this scenario, many do recommend this kind of product, due to the fact that the WiFi that is on a majority of client devices (phones, tablets, laptops) isn’t fast enough to be able to make most of this speed. The Ethernet socket located on the back is joined by the power connection, power switch, WPS button, and reset button. In the front, there is a USB 3.0 port that can be used to attach a printer or share files off of a USB storage device. Given that this is a premium device, it definitely would have been nice for it come with two of these ports, but this is a minor issue. If you already have a WPS-enabled router, which these days most people do, then it is simple to get the EX7000 set up. Just plug it in, tap on each device’s WPS button, and that will take care of everything else. The same name is used on your new extended networks as the existing network you have, but with an additional EXT. The passwords should also be the same. However, if you don’t already have WPS, the router will need to be connected directly either through its default WiFi network, or through an Ethernet port. This is fairly typical. After you have reached the website to get the device setup, you will then be prompted to get signed up with the NETGEAR online service before being allowed to proceed any further. The standard test for a WiFi extender is to have the device setup at around a 5m distance from the routers, and in between two walls. Then, the speed of these extended networks is recorded by a laptop with a AC600 speed adapter, with a 2m distance through a wooden floor (above the extender, upstairs) and 10m distance with an additional wall obstructing it. Using this setup, the EX7000 completely blitzed its competition. At 2m, it was able to deliver 36Mbps on 2.4GHz and 23Mbps at 10m. On the same test, at 5GHz, those figures increased to 85.6Mbps and 100Mbps, respectively. There is no doubt that with the right hardware, the EX7000 is a reliable and fast WiFi extender. Should you buy the NETGEAR Nighthawk AC1900 (EX7000)? 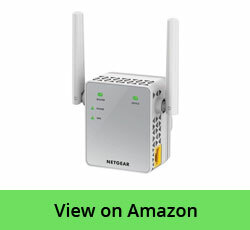 If you are looking for a device that will let you stretch your high speed network in an area where it isn’t practical to lay cables or in between two buildings, and you need to have this network with the ability to connect to a number of other devices, then the NETGEAR EX7000 is perfect. It is reliable, fast, and has enough features for supporting the computers of a small office or busy household. However, it is probably overkill if you just want to speed up browsing Facebook on your iPad on the couch. The WN2500RP from Netgear is an amazing device packed full of features. While many WiFi range extenders lack the strength to support the claims they make, this one supports both 2.4GHz as well as 5GHz bands. In addition, it has the standard 4 Ethernet connection ports located on the back. This way, computers can be hardwired in, allowing them to connect directly rather than using WiFi. It also features “FastLane” technology. This tech can boost performance specifically for constant connection uses, such as gaming or streaming videos. In order to conserve space, it’s designed to stand upright like a desktop computer tower rather than flat like a traditional VCR or even the older models. This allows it to take up less space overall. It has two feet that are able to snap into the bottom. This helps give the device a sturdy base. That said, the plastic casing is on the low-quality side. It feels a bit “cheap”, lightweight and brittle. It’s durable enough, but one might reasonably expect better for the price tag. The device works well, though like all range extenders, it must be placed correctly if you want to achieve the best performance possible. The WN2500RP from NETGEAR has built in LED indicators that can inform you of the strength of the signal. That way, you can better choose a location. Device setup is a rather straightforward process as well. There is no special software that must be downloaded, nor is there any kind of special installation process. This extender is also universally compatible. This means it will be able to work no matter what router make or model you have. All you have to do is link it to your router, and it will begin amplifying immediately. When it begins to amplify, it will create two networks that branch off of your current existing network. TP-Link’s top-of-the-line range extender is the TP-Link RE450 AC1750. While this extender appears to be a great choice for those looking to extend their WiFi signal throughout their home or business, take a look at the detailed features and specs to determine if it would be a good fit for you before making your decision. This dual-band range extender provides support for these networking standards: IEEE 802.11b, 802.11g, 802.11n and 802.11ac. The maximum theoretical bandwidth for the 5GHz wireless network is 1300Mbps and for the 2.4GHz wireless network is 450Mbps, leading to a 1750Mbps total. The TP-Link RE450 range extender is very heavy and large compared to similar devices. All 3 of the external antennas on this range extender are adjustable. There are several LEDs on the front of this device, indicating the status of various elements. On the right hand side there is the power button, a button to turn the LEDs on or off, and a reset button. On the left hand side is the Ethernet port to connect the other devices up to the range extender. It is very easy to get the RE450 range extender set up. The WPS button can be used on the range extender and the wireless router to get the two devices connected to each other within a few seconds. Or, you can hardwire the connection between the two devices using the available Ethernet port as well. After the setup is complete, the range extender should be moved to the room that you want to place it in for extending your wireless network coverage. The large circle on the front part of the range extender signals whether there is a good connectiion or not with the router. If not, your devices is too far from the router. Whenver the circle is blue, you have a good connection. However, if it turns red, you should move the range extender closer to your router. In terms of extending a 2.4GHz wireless network, download speeds are generally adequate, but upload speeds can be slow. When it comes to extending a 5GHz wireless network, it is fairly inconsistent. Depending on what your office or home setup is like, in some rooms it might deliver faster transfers, but in others won’t be very helpful. Based on the overall specifications and performance, it is a fairly expensive range extender promising to deliver fast wireless transfers and good coverage. Unfortunately, it does offer a bit of uneven performance. In some parts of your office or home, you may get coverage that is very good from the range extender, but in other areas it might be disappointing. There are other range extenders, like the NETGEAR AC1200, which are rated higher and may be a better solution when you’re looking for consistency with your wireless connectivity. The TP-Link AC1200 is quite simple. It only takes a couple of seconds to get it setup and begin using to increase your WiFi. Just plug it in someplace where you would like to have a stronger signal – or close to where you would like a signal, without it being too far away from your existing router. Next, tap on the large WPS button located on top of this device. Then press this same button that is located on your router. This will allow the two devices to find one another and start to share the WiFi. There are two bands on the TP-Link RE305, with a 2.1GHz network that is capable of speeds as high as 300Mbps, along with a 4GHz channel that has speed up to 867Mbps. Those speeds for this size of an extender are beyond acceptable. Additionally, since the RE305 comes with an Ethernet port, it can provide a consistent connection for a device as well as additional coverage. Items such as smart TVs and game consoles, which often suggest a wired connection, have a tendency to benefit from being hardwired. A handy indicator light is also available and located on top. It will let you now if you have put the extender too far away from the router. This will save you the hassle of having to sit around attempting to watch Netflix and not understanding why it is taking so long for the page to load. In use, this device is relatively reliable and good, and it immediately begins to work with a stable connection and adequate speeds. The design and layout of the device is relatively attractive as well. At the same time, it is thin and small enough that it will fit behind a bed or furniture so that you can forget about it. It is very easy to appreciate seamlessly integrated technology. For the price, this is one of our top 10 compact range extenders, it’s just not as powerful as some of the other devices in this similar class. The RE7000 extender carries the AC1900 tag but is slightly different compared to the past’s typical 1900 solutions. For the RE7000, a MediaTek platform has been used by Linksys with 300 Mbps on the 2.4GHz band and 1,733 Mbps on the 5GHz band which Linksys has given birth to its AC1900+ branding. That compares with the typical AC1900 that has a 600 Mbps 2.4 GHz radio and 1,300 Mbps 5GHz radio. Other technology includes seamless roaming for those who use an extender and Max Stream router, Beamforming and MU-MIMO. 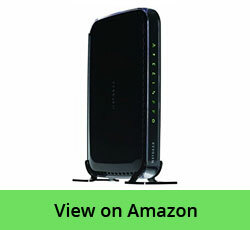 Compatibility makes it possible for the extender to be used with all modern routers. However, you will benefit more if you stay with the Linksys Max Stream lineup. The RE7000 is a very solid kit for those who want to be able to extend their network using AC1900+ technology. For people who already own or are planning to get a Max Stream solution, the extender interfaces even better to offer seamless roaming. Like with past Linksys extender solutions, the RE700 features spot finder technology to help with place the extender for both range and performance. When tested, its build quality has been thought to be very good and also features a friendly design that allows you to plug this device into a top outlet with the bottom being used by the extender. 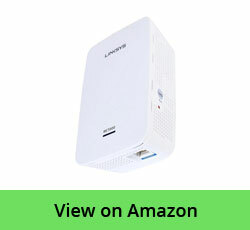 The Linksys RE7000 AC1900+ extender comes with a one-year warranty. The reset button and WPS buttons are located within reach on the right side. On the bottom of the RE700 there is a single gigabit port that extends to a switch or single device. In terms of performance, it was tested utilizing an AC2600 router that was in bridge mode in order to get a good connection to the 1733 Mbps band. With the 5GHz band, it was possible to get speeds of 450+ Mbps, while the 2.4GHz hovered just under 100 Mbps. For the 2.4GHz band, performance was average, however the 5GHz band truly excelled, and reached to nearly 480 Mbps. The RE700 overall is a great solution for anybody who wants to extend their network, but for those who are on the Linksys bandwagon already is even better. 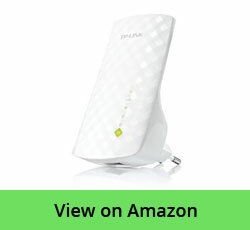 A WiFi extender or repeater is used for extending your WiFi network’s coverage area. It works through receiving the existing WiFi signal, and then amplifying and transmitting the signal that has been boosted. Using a WiFi repeater allows you to effectively double (or more) your WiFI network’s coverage area. The device can help to reach even the far corners or your office or house, different floors of a building or home, or even extend the coverage out to the yard. What is the different between a WiFi repeater, booster, or extender? Generally, WiFi repeaters, extenders, and boosters are the same thing – they are devices for improving WiFi coverage. No clearly defined differences exist between devices that are described by manufacturers as extenders or repeaters. However, WiFi extenders don’t all work exactly the same way. Several different types of devices are available and we will be explaining these differences belong along with how they work, helping you to select the best WiFI repeater to use for your individual situation. What should I test first if I am having problems getting WiFi signal in parts of my house? Before trying a WiFi extender, there are a few other solutions for you to try out first. The easiest one is just to move your WiFi router to a different location. You want it to be as centralized as possible. However, if that doesn’t help (or it isn’t practical to change locations), check to see if you need to upgrade your router. If it is old, you might need to upgrade and get a model that is more powerful. Some of the top networking brands like NETGEAR, TP-Link, and ASUS all have great options for wireless routers. Newer routers will offer 802.11ac, which is the next WiFi generation. Also, they are often dual band routers that come with 4+ Ethernet ports for use with game consoles, PCs/laptops, and smart TVs. Some routers also have specific technologies allowing for the router to concentrate its WiFi signal in the direction of your WiFi devices. The performance and speed of your network is significantly increased when you target the signal on your WiFi to where it is being used. My WiFi is already in the best possible location! I have an up-to-date router! However, I still have unreliable coverage. A WiFi extender might be the best solution for you! You have a few different options to choose from. Depending on your needs, look through our Top 10 WiFi Extenders and see which fits your needs best. 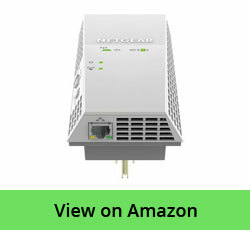 At a quick glance, our top rated device is the NETGEAR AC1200 based on performance and cost. If you’re looking for something with better performance and speed for heavy gaming or media streaming, check out the NETGEAR Nighthawk X4 AC2200. It’s rated as our top premium extender. Additionally, if you want a great unit with additional coverage and you want to keep costs relatively low, look at the NETGEAR AC750. We’ve rated that as our best WiFi extender if you’re on a budget. How do WiFi repeaters work? A wireless repeater acts exactly as you would think. After connecting securely (if necessary) to a network, it finds existing signals from a router or access point, and boosts or transmits signal to a further area. When positioned correctly, wireless range extenders are extremely effective at eliminating dead spots and slow speeds. How is a WiFi repeater installed? It is really easy to install a WiFi repeater. You just need to put a repeater in an area that is able to receive the WiFi network that you have, and attach it with the power supply. You can then log into your WiFi repeater form your computer and type in your existing WiFi network’s login and password information to let the WiFi repeater connect and extend. If you happen to have a difficult situation, like a guest house in your yard, detached garage, or even an office layout that’s spread out, a WiFi range extender can help. Additionally, if you are in an RV, for example, and there is a weak WiFi signal at the campsite, the repeater may be attached to your RV’s roof to boost the signal inside of the RV. Do mobile devices and laptop switch automatically between networks? Only if you are completely out of range from the first network. A second network is created by a WiFi repeater. If the first network isn’t available, then your device connects with the second one. However, in some parts of your home, your device will have the ability to detect both of the networks simultaneously. That means if you want to change to the boosted network from the original network you will need to disconnect and reconnect. Is the repeated network secure? Yes. The same security levels are offered by WiFi repeater as traditional WiFi routers. How about the speed loss that was previously discussed? Some speed loss occurs with all WiFi repeaters, though some are a lot worse than others. The way that WiFi repeaters work is they receive wireless signal and then re-broadcast it. A single band repeater must receive and then re-transmit every packet of data by using the same radio that is on the same channel. That may cost 50% of the bandwidth on a single band repeater. This issue is mitigated with dual band repeaters by connecting the router to one band and sending the WiFi signal on the other band. FastLane Technology is used by the newer NETGEAR models for improving performance through the use of both WiFi bands. It really helps to have a fast processor to allow for maximum WiFi throughput. Dual radios are one last features that help with reducing speed. If there are dual radios on the device, lower channels can detect the router or other devices, and higher channels can be used for re-broadcasting. If you’re noticing insufficient wireless coverage in your home or office, or if you’ve noticed slower speeds on WiFi, finding a great wireless range extender is a great solution.